Dr. Imad Abu Kishek, the President of Al-Quds University, sat across from me as we celebrated Iftar, Ramadan's nightly break-fast meal. The table was full of students and faculty from Brandeis and Al-Quds, all of whom share a common goal: to reestablish the partnership between our schools. The official partnership, which was groundbreaking in that it was the first of its kind between a Jewish-sponsored university and a Palestinian one, was suspended two years ago by Brandeis University's administration. The Brandeis University-Al-Quds University Student Dialogue Initiative is made up of students working together from each university to restore the Brandeis-Al-Quds relationship and reinstate our official partnership. 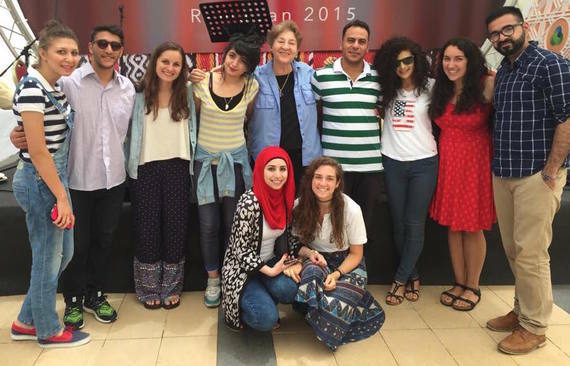 From June 22-24, Brandeis students and faculty from the Dialogue Initiative visited Al-Quds University. These delegation members, in addition to those from Al-Quds, had the opportunity to have productive conversations with Dr. Abu Kishek over Iftar. During the meal, he fondly told us of his experiences studying at Brandeis' Heller School from 2005-2007. Since November of 2013, Brandeis has suspended its ties indefinitely with Al-Quds University, effectively ending a decade-long partnership that included faculty and student exchanges. The suspension was in response to an offensive rally held on the Al-Quds campus by a small group of students. Even though the Al-Quds University administration strongly condemned the protest and passed new preventative measures, including a message from the Al-Quds president against violence and threats of violence, the Brandeis administration suspended our partnership. Despite the fact that students at both universities have been advocating for the reestablishment of the partnership and continuing to engage in dialogue with one another, the partnership remains suspended. There is a visible difference between the Brandeis and Al-Quds administrations' attitudes toward our academic partnership. In November of 2014, The Brandeis-Al-Quds Student Dialogue Initiative contacted President Lawrence for a meeting. That same month, over two hundred students sent Lawrence letters, explaining why they support the restoration of the partnership and urging him to reinstate it. Lawrence disregarded the demands of over two hundred students and did not meet with the Dialogue Initiative, despite our requests. After five months of being ignored, Brandeis students and alumni sat in Lawrence's office during his student office hours in hopes of meeting with him. At the end of the sit-in, Lawrence finally agreed to meet with students about the partnership, but this meeting unfortunately did not lead to any progress toward reestablishing the relationship. In contrast to the Brandeis administration's closed attitude toward the partnership, members of the Al-Quds' administration met with Brandeis and Al-Quds students during the Dialogue Initiative's visits both this summer and last summer. Dr. Abu Kishek and other members of the Al-Quds administration extended their hospitality and willingness to engage with members of the Brandeis community. They shared Iftar dinners with us, arranged for us to stay in a hotel in Ramallah, prepared educational programming and dialogue sessions, and took us through tours of their campus and other parts of the West Bank. Al-Quds students, faculty, and staff repeatedly expressed their excitement and determination in working toward reinstating the Brandeis-Al-Quds Partnership. My visit at Al-Quds University was my first experience having dialogue with Palestinians living under Israeli occupation in the West Bank. Interacting with the "other" and listening to my Palestinian peers' narratives was a powerful experience for me. It reiterated the importance of dialogue and helped me gain a stronger understanding of the Israeli-Palestinian conflict and how I am implicated as an American Jew and a Brandeis student. Brandeis is a non-sectarian, Jewish-sponsored university that seeks to build an academic community whose members have diverse cultures, backgrounds and life experiences by engaging members of our community as active citizens in a multicultural world. As a Brandeis student, it felt only natural for me to have this kind of experience, acting with the values that my university prides itself on. As a Jewish student who goes to a Jewish-sponsored university, it was a unique opportunity for me to have dialogue with Palestinian students. As a Jewish-sponsored university, I would expect for Brandeis to uphold Jewish values: love thy stranger (Lev. 19:34). Loving the stranger is not just refraining from harming, humiliating, or wishing pain upon someone. Loving the stranger is not just respecting someone. To love the stranger is to actively listen, validate, and befriend. Where tensions are high between Jewish and Palestinian communities, the meaningful conversations I had with my Palestinian peers helped me understand the importance of partnership between a Jewish-sponsored university and a Palestinian university. At Al-Quds, I was proud to represent Brandeis despite my administration's choice to not put their morals into practice. Since President Fred Lawrence suspended Brandeis's partnership with Al-Quds University in 2013, Brandeis students, alumni, and faculty members have taken it upon themselves to visit the Palestinian university to keep the partnership alive. Over the past two years, the Brandeis-Al-Quds Student Dialogue Initiative has brought Brandeis community members to visit Al-Quds University three times. Each time, members of the Al-Quds community have welcomed us with open arms, a willingness to have productive discussions, and an inclination to reestablish the Brandeis-Al-Quds Partnership. The Brandeis-Al-Quds Student Dialogue Initiative plans to take steps toward reconciling this relationship by hosting a group of Al-Quds students and faculty members at Brandeis this year. We hope the Brandeis administration will reciprocate the generosity and kindness the Al-Quds administration has shown members of our community since the partnership's suspension. On the delegation, students from both schools wrote letters to their schools' administrations, asking that each university president contacts the other. This is an essential and formative step toward restoring our relationship. Now, we are just waiting on cooperation between the Brandeis and Al-Quds administrations. The purpose of the partnership when it was established twelve years ago was to strengthen academics and opportunities at both institutions and educate each university about the benefits of cooperation, goodwill, and understanding. Moving forward, I hope the Brandeis administration can remember that a partnership with Al-Quds is central to Brandeis' mission and educational goals.